�	Built, Trained, Inducted and Managed a team of Monitoring and Evaluation officers assigned in business regions. �	Designed Monitoring and Evaluation plan for the project. �	Developed standard tools and procedures for data collection forms to use in implementation of monitoring plan. �	Performed data collection, data analysis and data interpretation to support project evaluation. �	Conducted baseline surveys and impact study on programs and projects assigned. �	Ensured all objectives and goal of the program and projects were met. 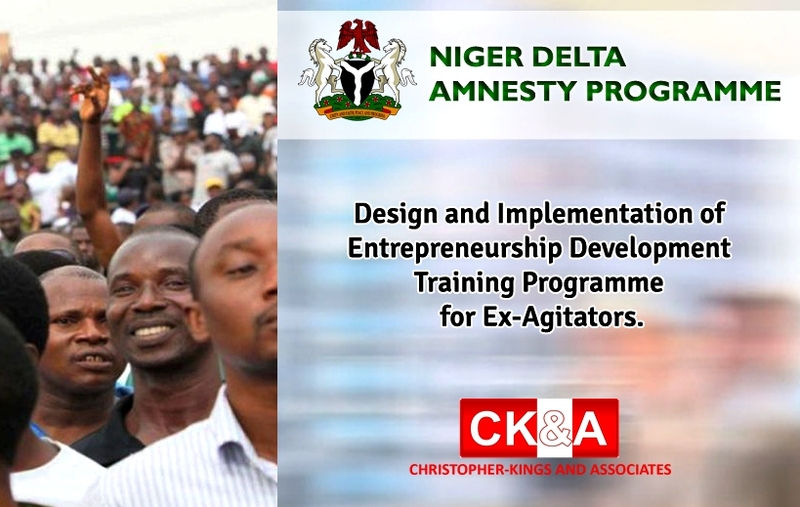 About Project: This project entails the Design and Implementation of the Entrepreneurship development training programme for ex agitators under the amnesty programme. It entails participant profiling, Ability assessment; Training delivery, design and placement of students on apprenticeship programmes, and post training analysis. Job Description: Design and Implementation of Entrepreneurship Development Training Programme for Ex-Agitators.